Considered to be the industry leader in online poker, PokerStars is THE site of choice for recreational players and sharks alike. Stars offers unparalleled customer service and quality tournament schedules and guarantees for just about any poker player. Even after PokerStars exited the United States market in 2011 following Black Friday, the site continued to see soaring traffic and today boasts in excess of 30,000 real money cash players (Slovakian players are not accepted) during peak times according to data aggregator sites like PokerScout.com. PokerStars is located on the Isle of Man where they are fully licensed and regulated. The company is owned by Amaya Gaming, a company who purchased PokerStars parent company, The Rational Group, in 2014 for $4.9 billion. Unfortunately for the grinder community at PokerStars, Amaya will be eliminating the very popular VIP SuperNova Elite program by the end of 2016, which had previously allowed high-volume players to earn up to 60% rakeback on their play. Great bonuses for all new players. Most guaranteed money tournaments ANYWHERE. Highest-trafficked poker site in the world. Toughest cash games around the globe. New management plans to rid the site of SuperNova Elite benefits for grinders. Currently, PokerStars offers two types of bonuses for new players. Players can start off small and take advantage of the FREE $20 bonus or instead choose a 100% bonus up to $600. Either way, you will be able to earn an easily clearable bonus to use on the virtual felt. The smaller of the two bonuses for new players at PokerStars is the Free $20 bonus. 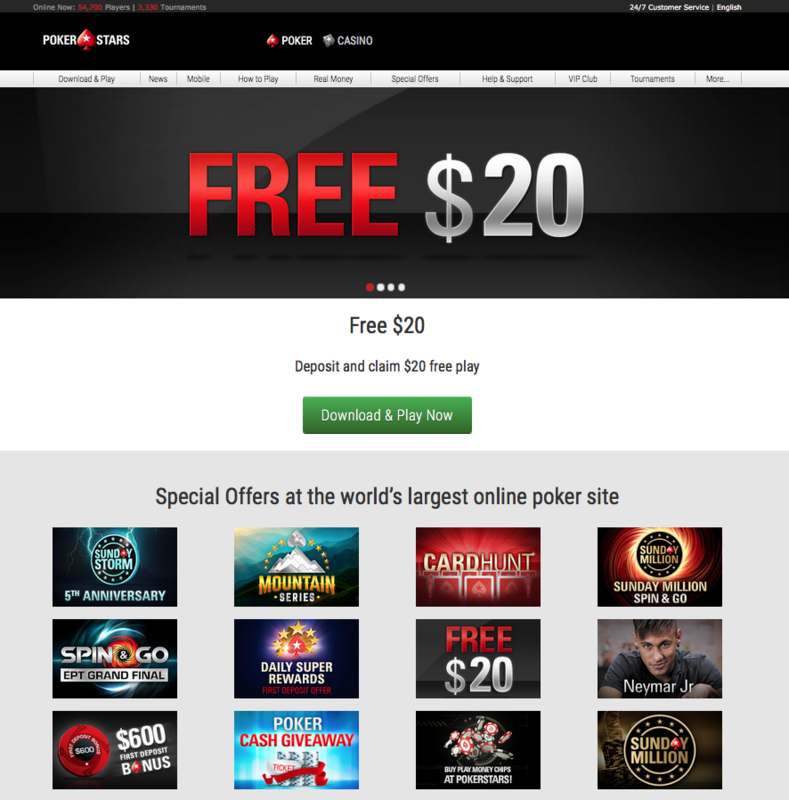 Deposit $20 or more to PokerStars by using bonus code FREE20 to earn $20 in free bonus cash. You will also receive $1 million in free play money chips which can be used to practice game play or just for fun. You will receive your free $20 within 36 hours of taking advantage of the bonus. The 1M Play Money chips will be credited at the time of deposit. When you make a larger deposit than $20, you should take advantage of the 100% First Deposit Bonus. Use the code STARS600 and you will be able to claim a 100% bonus worth up to $600. You can actually claim the full value, $600 worth of bonus cash, by making three different qualifying deposits in a 60 day time frame. Once the deposit is made, you will need to earn VIP Player Points. These points are earned by playing real money poker games. You will need to earn 200 VPPs to be able to release $10 in bonus cash. Players have four months after the qualifying deposit is made to earn the VPPs to release the full bonus. The VIP program at PokerStars is a steps program that allows you to complete steps to earn StarsCoin. Play games and complete the steps to earn the StarsCoin which can then be used in the VIP Store. You can use the coins to earn entries into tournaments, cash and free gifts. VIP Steps is a new reward program introduced by PokerStars at the beginning of 2016. StarsCoin replaces the Frequent Player Points with a progress bar added to the table to help you see your Step progress along the way. Each level requires a certain number of StarsCoin to be earned and steps to be completed. You will have access to VIP cash rebates, merchandise, tournament tickets and more based on your VIP reward level. The gaming software of PokerStars is created in-house and is operated by Rational Enterprises. When you open a new account here, you will need to download the software on your PC or Mac device. Mobile gaming is offered as well to allow you to take your gaming on the go. Follow the easy instructions to set up your account and enjoy online poker gaming in just minutes. Once you have created your new player account at PokerStars and downloaded the software, you will be ready to play. 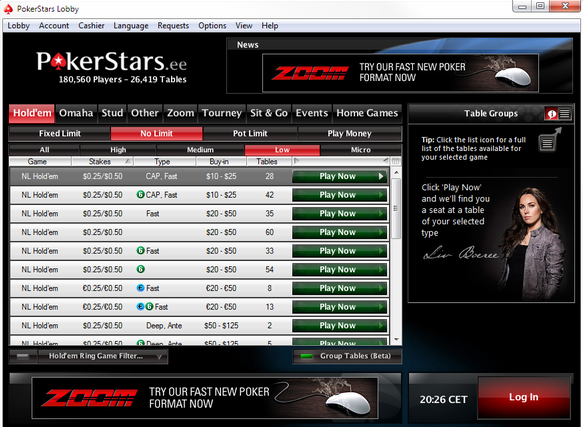 The lobby of PokerStars has been streamlined to help you locate ring games or big-money tournaments with ease. Find the game types you enjoy with a variety of stakes to get in a quick cash game or try your hand at a major tournament simply by viewing the tournament section of the lobby. The easy-to-use filters make it very simple to add or subtract different types of games, limits and tournament selections with just one click. The lobby lists every aspect clearly, from game type to tournaments, SNGs, events and more. Find the high stakes, mid stakes, low and micro with options for every game and limit type. 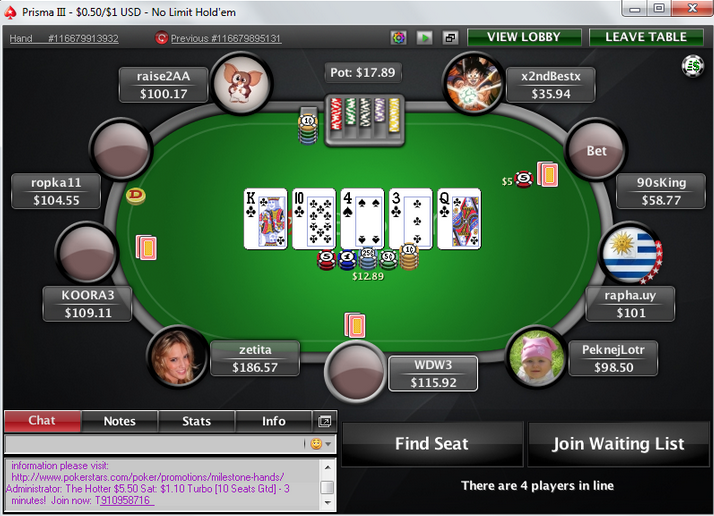 From the poker table, you will be able to view the current and previous hand, add chips to the chip tray, leave the table, chat or make notes from one screen. There are tons of table skins to choose from and of course the always popular multi-colored deck. A full list of acceptable software options can be viewed here. Take your online poker gaming on the go when you download PokerStars for your mobile device. The software application for mobile gaming can be downloaded for a number of platforms, offering game play via tablet or mobile through the App Store or Android Marketplace. The same great features and customer support are offered on the mobile version with the Web Cashier making it easy for you to manage your bankroll while you play from your mobile. PokerStars offers several poker variants for you to enjoy with Texas Hold’em being the most popular, which is then followed by Omaha and Fast-Fold versions of both games. The standard games found at the site include such other games as Omaha Hi/Lo, 5 Card Omaha, 5 Card Omaha Hi/Lo, Courchevel, Courchevel Hi/Lo, Stud, Stud Hi/Lo, Razz, 2-7 Triple Draw, Razz, 2-7 Single draw, HORSE, 8-Game Mix, Triple Stud and Badugi. When it comes to tournament game play, you will find SNGs and MTTs plus tons of other options abound. You will find options offered around the clock from turbos, freezeouts, bounties and more. PokerStars is also known for various poker tournament series including the World Championship of Online Poker, Micro Millions, Spring Championship of Online Poker and so much more. Take part in regular guaranteed tournaments or earn your spot at a live tournament series sponsored by PokerStars including the European Poker Tour or the World Series of Poker. PokerScout.com has PokerStars sitting in the number one spot for real money traffic when it comes to their online poker offerings. During peak times, PokerStars has 30,318 players hitting the tables. Their 7-day average exceeds 17,000 cash game players a day. The most popular game is No Limit Texas Holdem in both regular ring game form and Fast Fold Poker form. PokerStars also offers a full online casino, with games like roulette, blackjack, slots and more being offered in both play and real money versions. Enjoy a ‘Play Now’ version or a more traditional downloadable version to quickly find your favorite casino games – especially if you’re looking for a nice break from poker. Sign up for the casino now to take advantage of the 100% First Deposit Match Bonus from PokerStars worth up to $300. PokerStars also is breaking into the daily fantasy sports business and recently launched StarsDraft as an alternative to sites like DraftKings and FanDuel. As you start to fund your new player account at PokerStars, you will find the online poker room offers only safe and secure financial methods. The wide variety of financial transaction methods offered helps you to find the perfect option for depositing and withdrawing at PokerStars. After depositing money into your player account and enjoying poker game play, you want to be able to quickly withdraw your cash after winning. Below are just a few withdrawal methods offered at PokerStars. Be sure to choose your country of origin to ensure you have the ability to use one of these trusted options for withdrawing your winnings. PokerStars offers the Fast Deposits option as well which will allow you to choose financial methods for deposits that will provide you with quick cash for game play. These methods include MasterCard, Visa and NETELLER. Support is available at PokerStars 24/7, allowing you to reach customer support at any time. Check the comprehensive Frequently Asked Questions section for answers to commonly asked questions. You will find email support can be reached at [email protected] when you need to email a question or concern.